So far it has been a really hot, dry summer and as a result the water temperatures have really increased on the Little Red River and actually caused some fish kills on the river. Over the past two days the Southwest Power Administration and the ACOE finally ran a significant amount of water to lower the water temperature in the river and the fly fishing quickly improved. 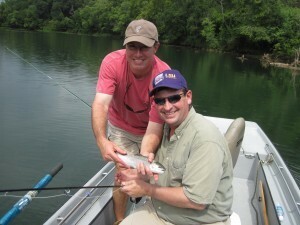 Today we had the privilege of fly fishing with two old Army buddies, David and David. 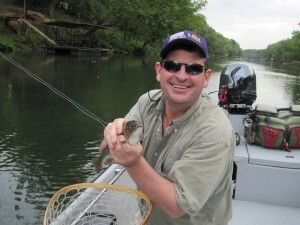 One is a physician in Little Rock, Ar, and the other David a physician in Lafayette, LA. They absolutely way laid a bunch of Rainbow Trout on #14 Chronic Sowbugs with a #20 red Zebra Midge for a dropper. 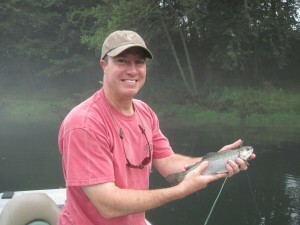 The two old friends had a great time and we all enjoyed a cool, foggy morning catching lots of trout in cold clear water!